Haleakala means “house of the sun” and if you get a chance to experience sunrise from the 10,000 ft summit you’ll know why. Sunrise at Haleakala National Park has been one of the top attractions on Maui pretty much since it was first written about by Mark Twain in 1866. Through the 1920s and ’30s visitors would travel by steamship to Maui from Honolulu just to experience Haleakala. They made their way to the summit via horseback. Today over one million people visit the park each year and not just for sunrise. This expansive national park not only encompasses the 7 miles long, 3 miles wide and nearly 2,600 ft deep crater but spills down the slopes over the eastern crater rim through the Kipahulu Valley to the Pools of Oheo along the road to Hana. There are extensive hiking trails in the crater and several cabins that can be rented although reservations are needed well in advance. The summit views at the Visitor Center are breathtaking anytime of day when the weather allows it. At 10,000 ft elevation the weather can change quickly, bringing high winds, rain, bone chilling cold and even snow!. The road leading to the summit is a winding switchback that ascends from sea level to 10,000 ft elevation in just 38 miles – the largest elevation change in the shortest distance on earth! The park contains many endangered species found nowhere else on the planet. They evolved in isolation for hundreds of thousands of years before the first Polynesians arrived around 1000 years ago. There is nothing like the Kipahulu section of Haleakalā National Park. The famed Pools of Oheo (AKA, Seven Sacred Pools) is a wonderful and safe spot for swimming on the road to Hana. Check it out on your next drive or visit, itʻs past Hana at the end of the paved road. Make sure you plan your day so you donʻt get there too late! There are several ways to experience Haleakala National Park. If you’d like to see the sunrise you will need to make a reservation with the Park Service. Otherwise, you can visit it on a first-come-first-serve basis. There is normally plenty of parking during the rest of the day although Sunset is getting busier. Kipahulu, the Pools at Oheo, accessible by traveling on the road to Hāna is also part of Haleakalā National Park. 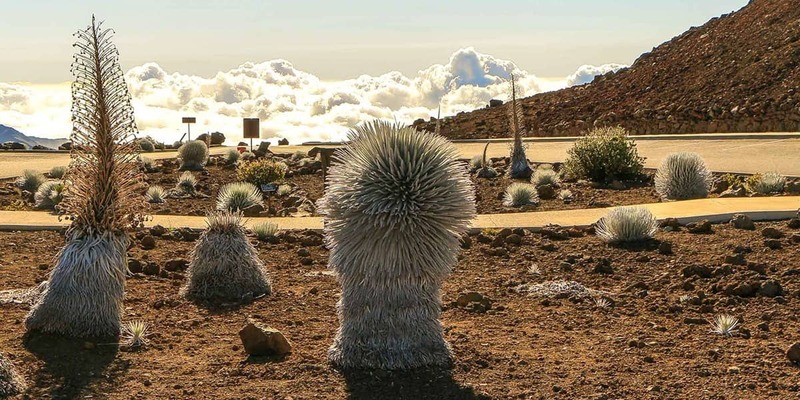 There are several ways to experience Haleakala National Park. If you’d like to see the sunrise you will need to make a reservation with the Park Service. A reservation is not needed any other time of day. The views and vistas are amazing from the parks higher elevations where up to four islands can be seen on a clear day. Sunsets are also stunning to see from Haleakala and there is a reason for the large array of telescopes up here – the stars and moon are crystal clear at the summit! 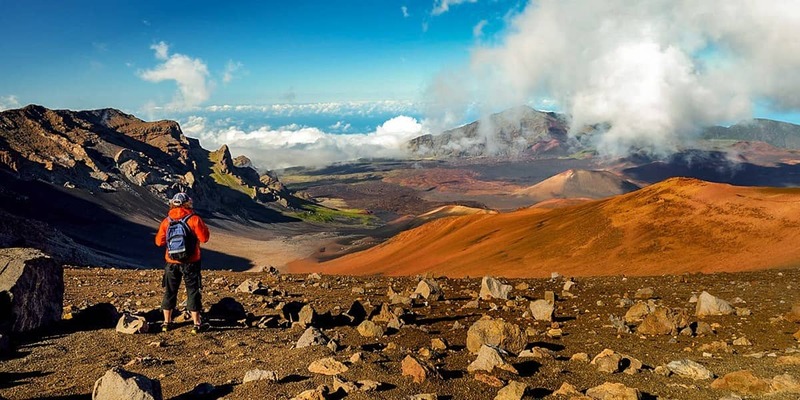 There are lots of advantages to taking a tour to Haleakalā National Park, including having a stress-free experience with a comfortable guide. During WW2 Maui was home to two major training bases. One was a Naval Air Station at Puunene in Central Maui and the other was the 4th Marine Division in Haiku. The Marines trained in Haleakala Crater. Haleakala’s park boundaries extend from sea level to 10,023 ft elevation. The 38 mile long road to Haleakala’s summit covers the same ecological zones you would encounter driving from Mexico to Canada. The only native mammals found in Haleakala National Park are the Hawaiian Hoary Bat and Hawaiian Monk Seal. All other mammals were introduced and have been highly destructive. 0% of the over 1000 native flowering plants in Hawai’i are endemic, meaning they are only found in Hawai’i.